In my previous blog I have outlined how paramount an omni-channel strategy for retailers is. See also the publication by McKinsey about the need to go Omni-Channel. 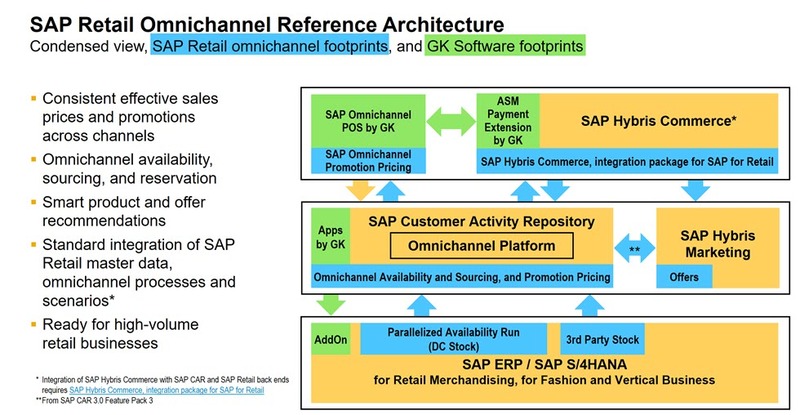 Now I would like to dive into the SAP components retailers can use to build SAP Retail Omni-Channel Commerce scenarios, and describe their role, capabilities and integration in more detail. In the following chapters I would like to describe the scenarios and data flow between these main components. This should be a high level reference recommendation for your orientation. Each key component has its special role in the omni-channel landscape, which stretches well beyond pure commerce scenarios. The SAP Hybris Commerce Suite is THE central platform that drives and manages digital commerce channels within an SAP Retail omni-channel landscape. The data and processes required by Hybris Commerce are hereby retrieved, connected resp. aggregated from backend system(s), e.g. This makes the Hybris Commerce Suite THE DIGITAL HUB in an Retail omni-channel landscape, providing backend data and processes to the digital shop-front in a transparent, flexible and highly adaptable way. 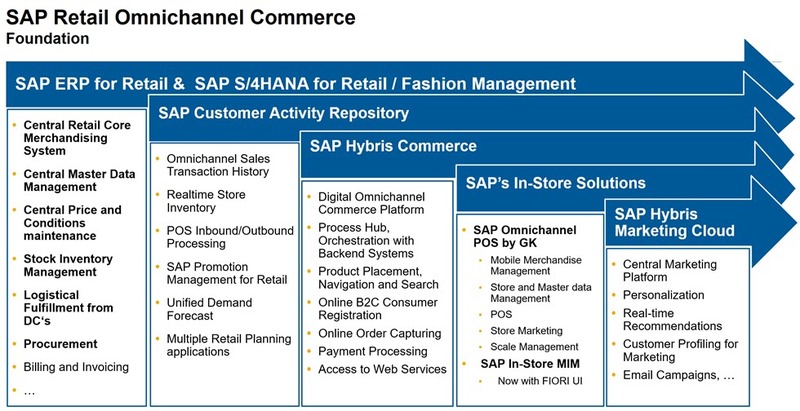 In an ideal SAP Omni-Channel Commerce landscape, all digital channels are powered by the Hybris Commerce Suite PLatform, which provides data (products, prices, promotions, stock level) and application logic (order creation and status, account data, …) to the individual digital channels. The Hybris Commerce Suite is well integrated with SAP ECC for master data, order documents, etc. SAP Retail specific master data types are covered by Add-Ons, the so-called SAP Hybris Commerce, integration packages for SAP for Retail. The Online Documentation for the SAP-Hybris Commerce Integration resides in the Hybris WIKI, which however is restricted to Hybris license customers and partners only. In the given SAP omnichannel scenario SAP Retail is the leading system for product master data and prices. This master data is transferred from SAP Retail via the Hybris Data Hub interface (as XML based iDocs) to the Hybris Commerce Suite database. are created in the Hybris Commerce Suite. So a consumer can register and login with user/password completely within Hybris Commerce Suite, change the address afterwards etc. However, Hybris Commerce is neither a CRM system for managing customers, nor a governance system to harmonize and distribute master data across the solution landscape. This is the role of a CRM system (SAP CRM or SAP C4C) resp. SAP Master Data Governance. The consumer data record can optionally be transferred to the SAP IS Retail system via iDocs. Otherwise a CPD customer is used for the sold-to party in order documents. For omni-channel purposes it is strongly recommended not to use a CPD “dummy” customer ID, but to transfer and create real consumer data records in IS Retail/ERP, to have it available e.g. in Master Data Governance solutions, for reporting and for SAP Financials Management, just to name a few. In addition, consumer data records can also be replicated from Hybris instantly to SAP Cloud for Customer, to allow a C4C based service management. This feature was introduced with Hybris Commerce Suite 5.7.
are created by and in the Hybris Commerce Suite (based on the Asynchronous Order Management scenario) and are stored in the hybris database. Then Hybris order documents are replicated to a connected SAP ERP or IS Retail system. As outlined above, the Hybris Commerce Suite is well integrated with SAP ECC and SAP IS Retail for master data, order documents. An SAP Retail Industry Integration AddOn for Hybris Commerce is available, which supports to transfer and use Generic Articles in Hybris Commerce as well as merchandise category hierarchy. SAP Hybris Marketing is SAP’s Marketing Platform, evolved from the formerly known SAP CEI, enriched with SeeWhy capabilities as well as marketing planning and execution applications, just to name a few. In summary it is SAP’s Digital Marketing Suite, which was rated a “Leader” in the 2016 Gartner Marketing Resource Management (MRM) Magic Quadrant research report. SAP Hybris Marketing is rated as one of top three vendors in the ability to execute in the MRM Magic Quadrant. For example, SAP Retail can feed SAP Hybris Marketing with transactional and master data like product data, customer data, orders, sales organization, merchandise category assignments etc. 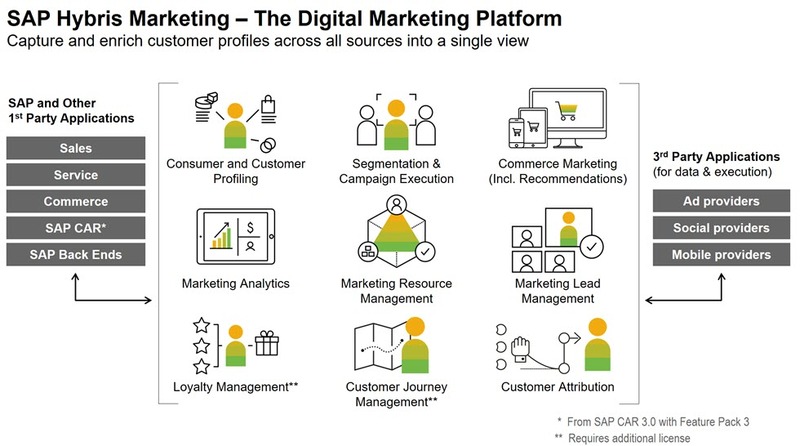 In the near future, SAP Hybris Marketing will be able to use customer profile information collected by the new SAP Hybris Profile solution, which holds the complete customer profile across the pillars marketing, sales, service and commerce. By integrating the Hybris Commerce Suite with SAP Hybris Marketing, the Web Content Management Solution application (WCMS) within the Hybris Commerce Suite can access SAP Hybris Marketing at design time to define the rule-based behavior of a given digital channel by including target groups/campaigns, order history, social media activities, customer master data, clickstream analysis results, wishlists, … , see the chapter below. SAP Hybris Marketing is independent from an SAP landscape and/or SAP backend systems, and can run and thrive even in a complete non-SAP environment. Hybris Marketing is already well integrated with the Hybris Commerce Suite, or to be more precise: with the Web Content Management Solution (WCMS) within Hybris Commerce. When integrating the Hybris Commerce Suite with SAP Hybris Marketing, the yCommerce’s WCMS can access Hybris Marketing Segmentation at runtime to have it identify the target group/campaign(s) of a Hybris consumer/customer. At design time target groups are defined in yMKT Segmentation, and so-called “campaigns” are created based on target groups with an added time stamp/validity period. So an campaign is a target group valid for a given period. At design time in Hybris Commerce WCMS, rules and actions are defined. In case actions are defined using target groups, the Hybris WCMS calls the yMKT Segmentation and copies the selected campaign(s) into Hybris WCMS. At runtime an anonymous consumer browses the webshop. Hybris WCMS calls yMKT Segmentation for campaigns even for unknown consumers, who still unveil some information like their browser and device, internet knot of dial in, product categories and searches the consumer performs , etc. As soon as the consumer identifies himself (cookie, login, registration) Hybris WCMS calls yMKT Segmentation and retrieves the information, to which campaign(s) the consumer is assigned to. Hybris Commerce applies whatever was defined at design time in WCMS for the given campaign(s). This schema is also applies to the Hybris Marketing Recommendation to recommend context specific products resp. offers, determined by HANA powered predictive algorithms. WCMS uses the information provided by SAP Hybris Marketing to maximize the personalized customer experience at the digital shop-front. 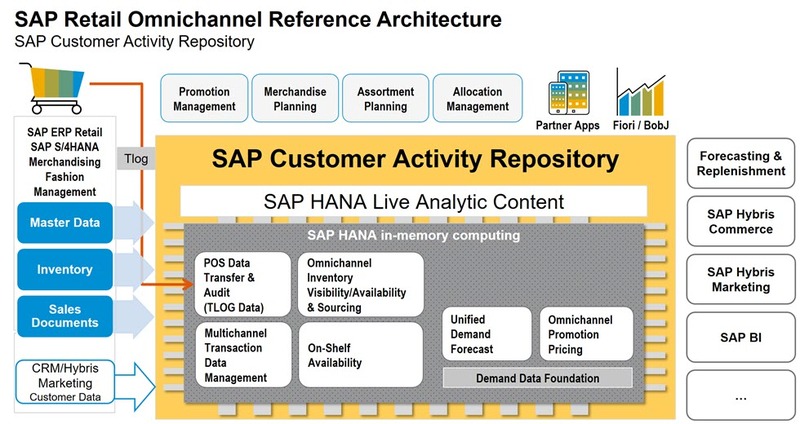 SAP CAR is the central Retail planning platform genuinely designed for and built on SAP HANA. SAP CAR collects and analyzes customer activities (e.g. orders) from all channels incl. the POS channels. While POS receipts are processed within the CAR application “Sales Audit” (= POS Inbound), non-POS based orders are provided by IS Retail, which also includes orders originally created in Hybris Commerce and replicated to IS Retail. store inventory information from CAR can be used e.g. to marry the physical channels with digital commerce, allowing to check inventory in store from webshops, click&collect (=buy online, pick up in store), etc. This makes CAR the central in-store data hub for true omni-channel scenarios, bringing the physical and the digital commerce space together. For performance reasons CAR is to be co-deployed with SAP Hybris Marketing, allowing POS data to be included in hybris Marketing based product recommendations based on order history, and for a more precise target group/campaign assignment. An Hybris Marketing RDS for Retail is available providing CAR based SAP HANA content to be used in Hybris Marketing, e.g. for using omni-channel transactional information and store related data in Hybris Marketing Segmentation. Make use of RDS packages for SAP CAR for an accelerated implementation. More information, figures, screenshots and links will be added to this blog as it becomes available. Find detailed blogs about Omnichannel Commerce innovations here. Stay tuned for updates of this blog. Hello Ingo, whene we call marketing recommendations and segmentetions in Hybris Marketing we mean that it’s Predictive Analytics or HANA PAL ? the algorithms used in hybris Marketing Recommendation are using PAL under the hood or are essentially HANA stored procedures which are more SQL like (think of TOP-N). We’re also planning to integrate APL based capabilities for further investments. The way how algorithms are built into the models also allows for strong extensibility if you have some on your own. hybris Marketing Segmentation is building on PMM (predictive model mgmt in hybris Marketing), which in turn is integrating to PAL or APL based algorithms. Obviously completely different algorithms, because the problem space in business perspective is completely different. thanks for this quite useful article. One thing I noticed: Aren’t ‘initiatives’ in Hybris Marketing called ‘campaigns’ for quite a while now? Thank you, Peter. Fixed it. We have a requirement from one of our customers for a backend integration between Hybris Commerce 6.3 and S4 (Retail) – 6100. Hybris Commerce 6.3 should sync up with S4 – 1610 (SAP Retail) version through Data Hub for Products, Product Prices, Inventory, Orders. Shareholder Information (Customer specific) will be maintained in S4 and will be synched to Hybris through Data Hub. Shareholders will be linked to Customer in Hybris and in S4. The above blog says that Hybris Integration package for Retail is not allowed for S4-1610. Would the integration between Hybris Commerce and SAP Retail (S4) for master data such as products, prices, inventory, orders be allowed? Could you please clarify if we would be able to integrate standard interfaces such as Products, Orders, Inventory, Customers, Orders between Hybris Commerce and S4 (SAP Retail Module) through Data Hub.